Miami, and Florida in general, is a notoriously dangerous place to walk. The top four most dangerous cities for pedestrians are all in the Sunshine State, according to Transportation for America, with Miami, a city of wide roads and narrow sidewalks, coming in at number four. 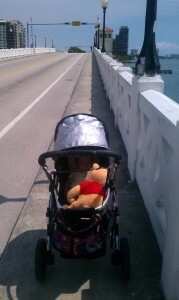 If you think walking and biking in Miami is risky, dangerous, and perhaps even a bit of a suicide mission … then you can probably imagine what it would be like to navigate our nightmarish streets with a baby in a stroller in tow. Oh!, you exclaim, certainly our famously rude drivers would change their nutty ways at the sight of a cute little one peeping out of its carriage, right? Sure, they may not stop for a regular annoying pedestrian who is waiting to cross a “STOP for pedestrians – It’s the Law” intersection … but they must stop for a baby! Well, in short: Nope. After having high hopes for my pedestrian future with a newborn, picturing polite drivers waving me across the street, I have had a rude awakening that stroller or not … to Miami drivers, I’m still just an annoying pedestrian not really worth stopping or even slowing down for. It’s become a nearly perverse enjoyment for me to stare down drivers at a marked intersection, looking right into their faces, brandishing the baby in front of me as if to say – what’s it going to be? Your car, or our lives? Who has the stronger will, who will give up first? Will you stop, or will I step out of your way to let you speed by on your extremely important mission to reach the next (red) stoplight 1 block down the road? Not only do the drivers of Miami make strolling the streets a survival game, the infrastructure confers second-class status on anyone who moves around on two feet. The above photo is typical of the kind of conditions the city offers on its sidewalks, Gerhard says. No wonder people move to the suburbs! Elsewhere on the Network today: Wash Cycle defends sharrows, and Systemic Failure reports on a recent study finding helmet laws did not result in a clear reduction in head injury rates in Canada.